The Cessna 180 and the U-206 are both a part of the Cessna 170 aircraft family, the most popular light aircraft in the world, with over 30,000 sold worldwide. 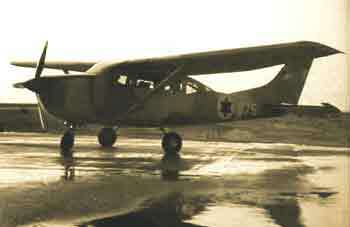 in 1968 two Cessna 180s were handed over to the IAF from Israel's police force and entered service with the "Flying Camel" squadron (the IAF's first squadron, formed during the War of Independence). In early 1968, after looking for a light transport and utility aircraft, the IAF elected to purchase the Cessna U-206 due to its low price and its easy handling characteristics. During the summer of the same year, 18 aircraft arrived in crates and after being assembled locally in the "Flying Camel" squadron, the first aircraft took to the air on November 29th, 1968. Although intended solely for the purpose of light transportation, different experiments were conducted to see how the type would perform in other roles. Attempts to use the Cessnas as border scouts or photographic aircraft were abandoned when they were found unfit for these roles. For a short time the U-206s served in the IAF's flight school in order to train navigators, but after a fatal crash in September 1974 they were withdrawn from that role too. After more than 30 years in service the Cessnas are still an IAF workhorse, on active duty day after day, but the busiest times for the type have always been times of conflict. Entering service during the War of Attrition and especially during the Yom-Kippur war and the 1982 invasion of Lebanon, the Cessna squadron was active 24 hours a day ferrying personnel and supplies to the different battle zones. Unlike other aircraft in the IAF, any pilot can fly the Cessna U-206, provided the pilot goes through a short qualification and an annual check up. There are 25+ Cessnas in service with the IAF today. Type: six seat light utility aircraft. Performance: max speed - 152 knots, ceiling - 15,000ft, range - 1,770km. Weights: empty - 807kg, max takeoff - 1,497kg. Dimensions: span - 36ft, length - 28ft 3", height - 9ft 3.5".